Little ones can imagine lots of adventures with these Mr. Potato Head figures mashed up with Marvel Super Heroes! 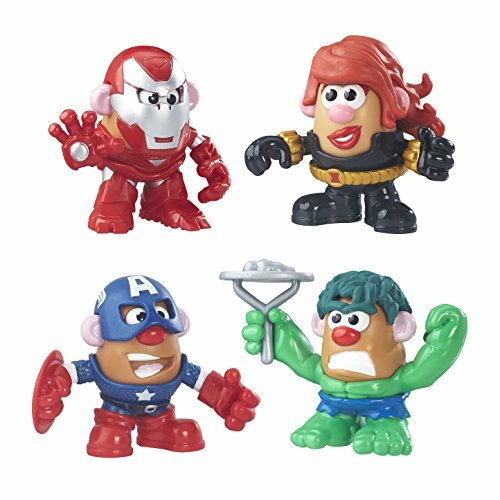 Kids can style these spuds like some of their favorite Marvel Super Heroes with pieces inspired by Marvel's Black Widow, Hulk, Captain America and Iron Man characters. Sized for little hands, the set includes 2" potato bodies, character headpieces, torsos and bases, plus a potato masher accessory. Kids can also mix up the pieces to create their own super spud characters. Most parts are compatible with other Mr. Potato Head and Mrs. Potato Head toys (each sold separately). Marvel products are produced by Hasbro under license from Marvel Characters B.V. Mr. Potato Head and all related characters are trademarks of Hasbro. If you have any questions about this product by Mr Potato Head, contact us by completing and submitting the form below. If you are looking for a specif part number, please include it with your message.